Earlier this year (2014), I happened to have a chance meeting with FZ FORZA in Asia. It is not a brand that is commonly seen around Asia but it has a strong presence in Europe. Looking back, it is a brand I have noticed become less prominent on the TV since its initial flourish in the 1990’s. Those times, you could see a fair number of Danish players using FZ FORZA. After chatting a bit to FZ FORZA, they explained they want to market more in certain Asian countries. However, they will not be going for the big sponsorship deals. Rather, they will be trying to focus on younger talents and up and coming countries. That sounds like a strategy that benefits both young professional players trying to establish themselves and also exposure of the brand at a mid-­‐market segment. You may have noticed recently FZ FORZA Facebook in Singapore and Malaysia and a Weibo page as part of their soft push into social media sites. 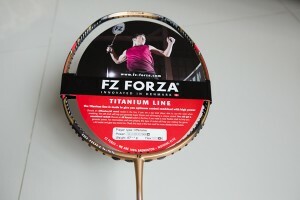 Some of you may have noticed the FZ FORZA website, the facility to personalize racquet bags and differences between the European and Asian catalogues. FZ FORZA tell me they put a lot of effort and resources into their products – the premise being able to have higher quality products at a competitive pricing strategy. Certainly, if they are not going to do the traditional marquee player/tournament sponsorship, then their outgoings risks will be smaller. Given that they promise a value for money product, they will be depending on customer loyalty and secondary referrals from this customer base. I will leave readers to investigate if their respective local FZ FORZA retailers are indeed priced more competitively for them. I was sent two out of four of the Ti range of racquets to review – the Ti 11.000 S (denoting ‘stiff’) and the Ti 11.000 F (denoting ‘flexible’). Rather than separate reviews on each racquet, I have elected to review of both racquets combined in a single article. The other two racquets in the range are a very stiff version (not surprisingly abbreviated to ‘VS’) and a medium stiff version (the ‘M’). 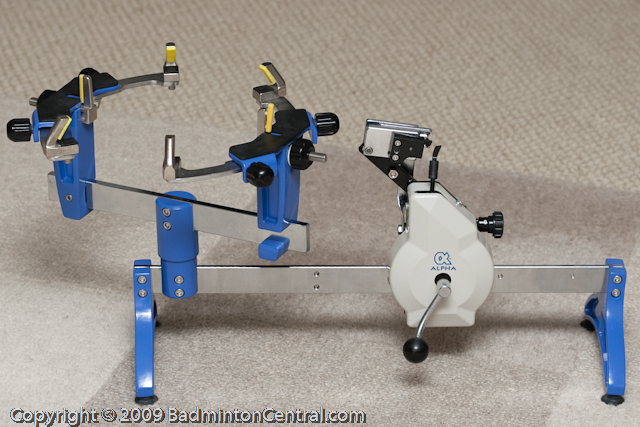 Those latter two racquets are are not part of the this review. The number system is a little strange – does having a 5 digit number (and a decimal point) actually mean anything? When I first went through the catalogue, there are many racquets with different names and numbers and it needs time to digest. The more digits that appear, the more complicated it appears to be to a new person unfamiliar with the Forza product range.. 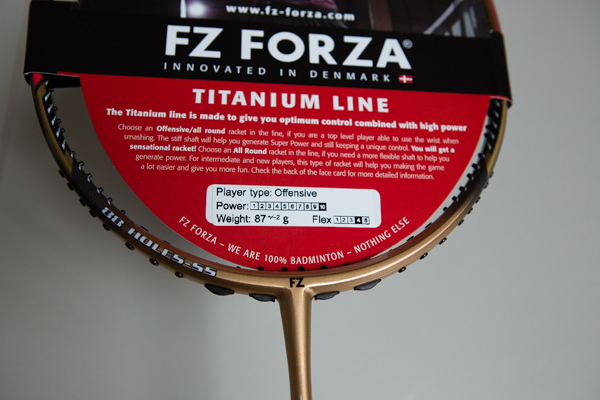 Both the Forza Ti 11.000 S and Ti 11.000 F come in an 88 hole pattern and the information given on the card indicates both racquets are designed for offensive players. 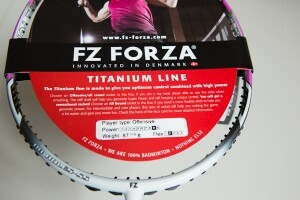 Forza explain that their racquets have the I power design. A little piece from their brochure is explains the shaft is thicker nearer the T joint which pushes the bending point of the shaft further up towards the head. It is noticeable, on physical examination, that the shaft is thicker nearer the T joint. The S version is a mainly gold colour, black accents, red dashes and a few white stripes. 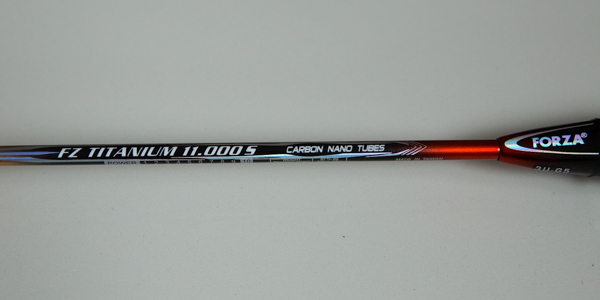 On the shaft, the name appears prominently with the words ‘carbon nano tubes’ in slightly smaller lettering. 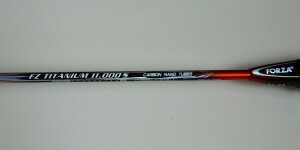 The head of the racquet also has the words ‘carbon nano tubes’ and ‘super control’. There are markings to assist the stringer on where to tie the knots. Around the shaft, there is a bit more technical information on the power, balance point and weight of the racquet. 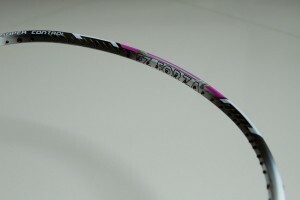 The flex of the racquet is printed as 4 out of 5 (rated ‘stiff’). 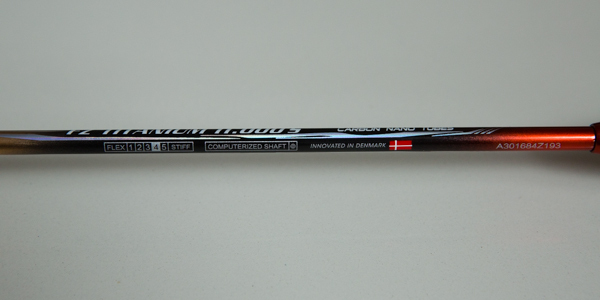 The words ‘computerized shaft’ appear, and we are made pretty clear that although the racquet is made in Taiwan, that it’s a Danish brand with a small Danish flag also printed. The F version is white and black with dashes of purple. No one colour dominates. Again, similar to the S version, we have the same information written on the shaft. 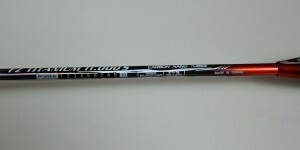 The power rating is 9 out of 10 and the flex is 2 out of 5 (rated as flexible). Comparing the colour scheme of the two racquets, the S version looks rather staid – it doesn’t really catch the eye. The F version is slightly better but a greater proportion of white on the racquet would look better. Both racquets went to MBS (Mybadmintonstore) for stringing with BG66 at 26lbs for this review. Forza claim that the 88 hole stringing pattern can add 5lbs to the stringing tension. First few swings without the shuttle and there is a clear difference in the feel of the swing. The S version feels as if having more weight on it and the racquet clearly feels stiff. Clearing the shuttle initially took me some time to adjust to and I attribute this to the stiffness of the shaft. By Forza’s own rating, the racquet is rated as stiff but my subjective feeling is that the racquet is very stiff indeed. In comparison, the F version feels a little more forgiving in this respect. It seems to be just a little bit easier to manipulate in the fingers and easier to adjust my timing. 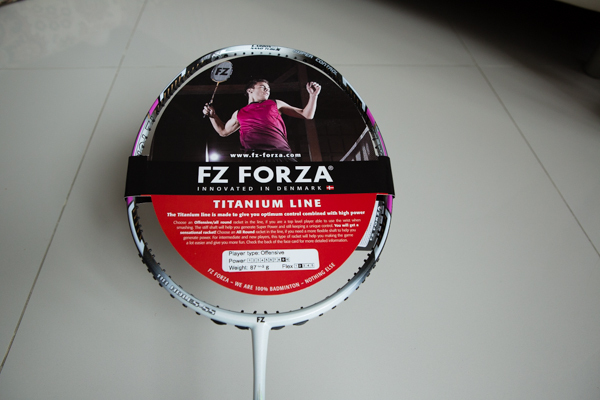 Even so, I still rate the racquet being on the stiff side despite it being classified by Forza as being flexible. 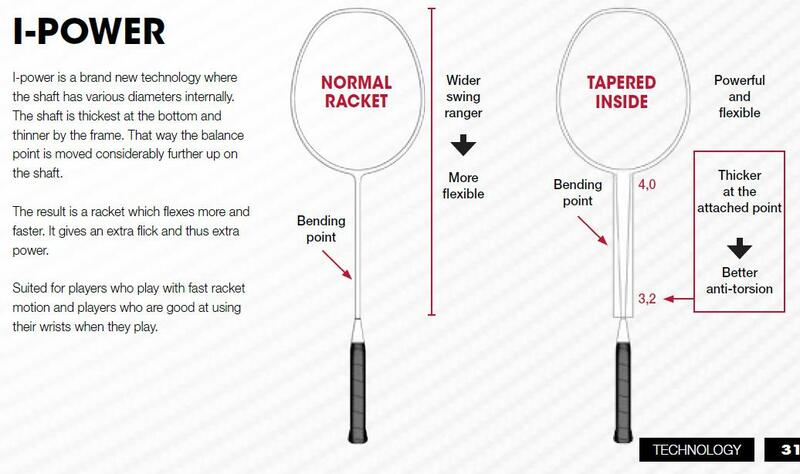 There is no universal rating for stiffness (or flexiness) of badminton racquets but this shows users should be aware that two different manufacturers’ ratings of stiffness of the racquet shaft may vary considerably. In general, I found the S version harder to adjust with overhead shots. 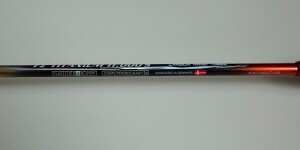 I think it was the stiffness of the shaft that made it difficult for me. I couldn’t quite get the timing right on smashes and in subsequent games, I did end up with mishits. Drives and underhand shots were easier to perform but again I couldn’t really get quite comfortable with the racquet. The F version was much easier to adjust to. When the racquet was used for the first time, the racquet had the impression of being hollow when the shuttle is struck. That was also the comment of another person I gave the racquet to try out. In terms of playability of the racquet, that doesn’t seem to have an effect on any of my shots but it is a rather interesting observation. I got a much better timing with this racquet compared to the S version – I think my swing and timing is less adjusted to the stiff racquets. With the easier timing, my smashes were better and I generated a nice smashing sound from the racquet. I did get a couple of people curious as to what strings and tension were in the racquet. With 3U racquets they sometimes feel a little light in the head for smashes but the S version reviewed here seems to have got it right. However, the more I used both racquets, the more I found myself actively searching for the F version in my racquet bag. I found the F version response pretty lively with a good doubles defense, fast reactions for drives and changes of direction in the doubles game. Remember that bit about the hollow feeling? Does that make the racquet less robust? How about if it clashes with another racquet? A clash is exactly what happened during one of the games. 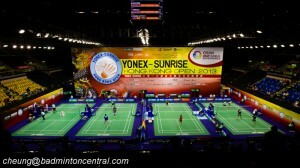 My partner’s Yonex nanospeed 9900 did not survive whereas the S version remained as cool as cucumber. Damping in both racquets was good with just a touch of vibration noticeable. 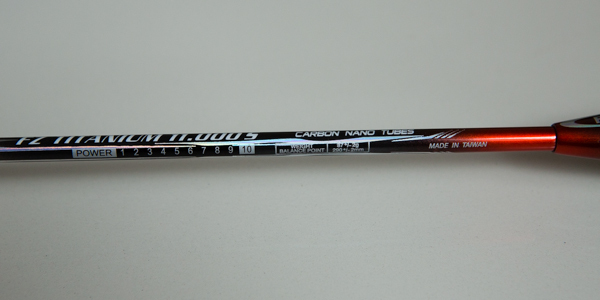 I quite liked that as it gives me a bit more feel in the racquet. Can the 88 hole stringing pattern really give an extra 5lbs of tension? I didn’t check the stringing frequency. The string tensions maintained well during playing but to be honest, I didn’t feel that the string bed has an extra 5 lbs of tension. The Forza Ti 11.000 S and F versions play quite differently. The ratings of stiffness seem to be a step higher than other racquets I have played with so players will have to be aware of this area. After a few sessions with both racquets, I found myself preferring F version more and more. 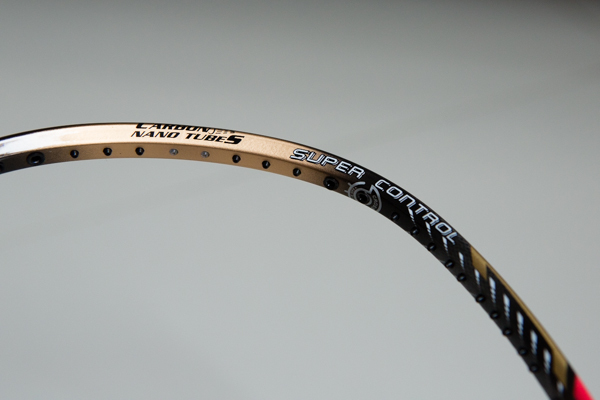 The S version looks to requiring more work by the user to adapt to if you are used to using medium flex or flexible racquets. Forza explained that CNT is the resin used as a glue between the graphite material and it is also used a filler in the holes and spaces of the racquet. 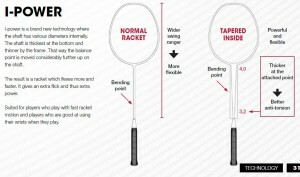 They also explained the stiffer feeling of the racquet might be a result of the 88 holes pattern. 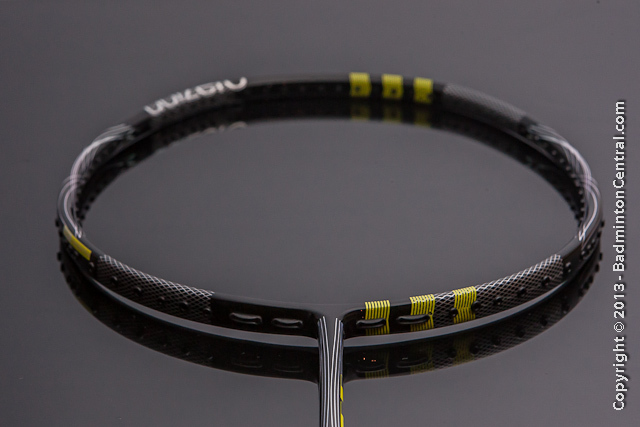 With a higher feeling tension, the stringbed will feel more firm and consequently the racquet might feel stiffer. Certainly, an interesting point so those using the Ti range might want to experiment with slightly lower string tensions compared to their usual. A very interesting point was the hollow feeling. Apparently, it is common for the hollow shaft and frame to be filled with foam. In their tests, Forza found the response better and shock/impact absorption to be better. 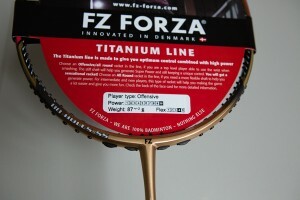 Forza omitted the foam as it also can create an unbalanced racquet. Certainly in this review, the initial feeling of it being hollow was a little strange, but this was something i got used to pretty quickly. In the end, my preference was for the F version – I did buy two more for my personal use!